Garmin has refreshed last year’s Fenix lineup, with all three watches getting an injection of new features. The Garmin Fenix 5 Plus is the flagship sports watch of the bunch, sat between the the 5S Plus and 5X Plus. You can go read our reviews of the Fenix 5S Plus, the smaller model that offers all the same features as this one; and the Fenix 5X Plus, which adds on a pulse ox acclimator that you won’t find on the other two. So where does that leave the regular middle sibling? The Fenix 5 Plus builds on last year’s model in a few different ways, none of which you’ll see on the outside. It gets Garmin Pay and onboard music, the first time we’ve seen these hit the Fenix range, to let you pay with your watch and load on your music files, respectively. It also now has fully routable TOPO maps, something that was exclusive to the Fenix 5X last year. Having put the other two watches through their paces, we’ve spent some time with the Fenix 5 Plus. Here’s our verdict. As mentioned above, there’s nothing new to see on the outside beyond a few new strap colours. In fact the only noteworthy cosmetic change in this year’s lineup is on the 5S Plus, which has had its screen bumped up to the same size as the middle model, making those TOPO maps more easily readable. That screen is 1.2 inches with a 240 x 240 resolution – the same as last year’s Fenix 5, which just about gives those colour maps enough room for visibility. The watch comes in either stainless steel or black diamond-like carbon, with those exposed screws unashamedly bare for that industrial – somewhat ugly, if we’re honest – look. The Plus also measures 47mm across and 15.8mm thick, weighing 86g. It’s hefty by today’s standard of sports watch, but remember that Garmin has packed a lot in here; the Fenix range is still one of the most feature-laden sports watches on the market. All three watches have the same physical dimensions as their Plus-less counterparts, so for those who want something smaller, go for the 5S Plus. I don’t mind the size of this one, but the weight can be a bit of a nuisance when running as it wants to bounce around a lot. Thankfully Garmin’s silicon straps are nice and comfortable even when fastened tight. All of the controls are done via the three buttons on the left hand side of the watch and two down the right. Unlike the Vivoactive 3 Music, there’s no touchscreen option here. This is the meat of it. This is what you came for. If you’re already an owner of a Fenix watch, you’ll know that these devices are exhaustive in their range of trackable activities. Running, cycling and swimming are table stakes for today’s sports watches, but the Fenix 5 Plus can track everything from golf to yoga via stand-up paddle-boarding. As I said in the 5X review: if it can’t track it, you probably shouldn’t be doing it. And if your activity is nowhere to be found among Garmin’s pre-set list, you can build a custom one. The Garmin Fenix 5 Plus still has that built-in Elevate heart rate sensor (Garmin's own tech) on the back, equipping it to track those all-important metrics during your workout. That is ably supported by FirstBeat algorithms, which handle the advanced biometric calculations – more on that shortly. Data screens can also be customised on the watch, so you can choose to see only what you want. You can also set auto laps and a metronome, and customise alerts. However there are limits here when it comes to customising workouts, and when it comes to creating custom training programs, you can build them on the Garmin Connect site and have them synced to your watch. One of the key new features here is full topographic maps, something that only the 5X got in last year’s lineup. This means you no longer need to opt for the most expensive, and biggest, of the three to get this feature. If you’re an avid hiker, this is a big deal, but note that you will forego the pulse ox acclimation feature. This gives you a measurement of your blood oxygen saturation (how much haemoglobin is carrying oxygen), which varies as you rise to higher altitudes. You can read more about that feature here. The Fenix 5 Plus is hugely geared to outdoor adventures such as hiking and trails – but running is its strongest suit. Out of the box you get a huge amount of data, up there with the best devices in Garmin's line up. You get all the pace, distance, calories stuff you'd expect, and the Fenix 5 Plus puts a lot of emphasis on elevation gains, which are put front and centre in trail running mode. But it's packed with advanced analytics too. Cadence and vertical oscillation are all part of the Garmin Connect roster of stats, as well as Performance Condition – which is an indicator of how well your body is prepped to run, displayed during the first 6 - 11 minutes of your workout. We've been a fan of Performance Condition since Fenix 3, and it's a good way of letting you know that your body might not be matching your training plan – but it's a bit annoying when it tells you that in mile one of a half marathon. And runners and cyclists alike will be be pleased that all data can be spat out to Strava as well. Garmin's devices are pretty much best-in-class for swimming and that continues on the Fenix 5. You'll need to input pool lengths, and you'll be rewarded with stroke count, stroke type, and SWOLF – the magic score for the optimum number of strokes per length. It's accurate it works – making it a great companion. If you want heart rate data, you will need to invest in the ANT+ HRM-Tri or HRM-Swim heart rate chest strap. Like its predecessor, the Fenix 5 Plus still boasts a host of insights into your fitness using Firstbeat's heart rate variability algorithms. This spits out scores on VO2 Max, Training Effect, Training Status and race predictions. Back when the Fenix 5 was released we took a bunch of wearables into the lab to test VO2 Max against a proper treadmill assessment and the Garmin was the best of the bunch – only a shade lower than reality. It's an impressive estimate, and we have no reason not to recommend the Fenix 5 Plus based on these tests. Likewise, Training Effect is also useful, which scores each workout for its effectiveness aerobically and anaerobically. And our favourite – Training Status – monitors the last seven days of workouts – and your previous session – to tell you whether it was Productive (improving fitness), Maintaining, or heaven forbid, Detraining. We actually loved these insights and they became a huge part of our weekly training, offering both motivation to get out and run, and immediate gratification, watching VO2 Max soar. But it's not without limitations. These advanced metrics are focused on runners. VO2 Max will only be estimated in running mode, with GPS tracked and heart rate, or cycling with a power meter which no-one has. So if you don't run, you're unlikely to benefit. These metrics are also skewed towards high intensity sessions. Hitting the track for interval sessions and getting your speed on will have this section light up green. When we've gone through periods of ultra marathon training, we might as well be sat on the couch eating pizza in the Garmin's eyes. A 34 mile run was deemed only to be "maintaining" fitness. We're not saying it's not true, it was extremely low intensity, but you don't get credit for miles. TOPO maps, for those not in the know, are more rich in detail and better at representing what’s actually there. That includes displaying vegetation, buildings, streams and, importantly, contour lines. Garmin has also added Galileo satellite tracking to the existing GPS and GLONASS, improving satellite coverage in more challenging areas, like cities and canyons. TOPO maps means you also get Garmin’s Trendline popularity routing, which will pick out popular courses nearby. We’ve tried this when hiking in the hills and in more urban areas, and in both cases it managed to come up with options. You can set these as round trip routes, but only for running and cycling activities. Another benefit of TOPO maps is being able to search for points of interest on the watch, and then have it route you to them. You can also put in the coordinates or set it to point at a location you’ve saved. For finding nearby restaurants or entertainment spots – both options Garmin gives you – it’s much more fiddly than just pulling out your phone, but say you’re out of service range and in search of somewhere to rest, this feature could be handy. Heart rate is more or less as expected, and the story hasn’t really changed since last year. In terms of accuracy the Fenix 5 Plus stayed pretty much locked onto a chest strap for the entirety of low to medium intensity runs and cycles, give or take a few bpm – and let's remember that chest straps aren't 100% accurate. But with optical monitors it's pretty easy to crap out the data, if you really try. 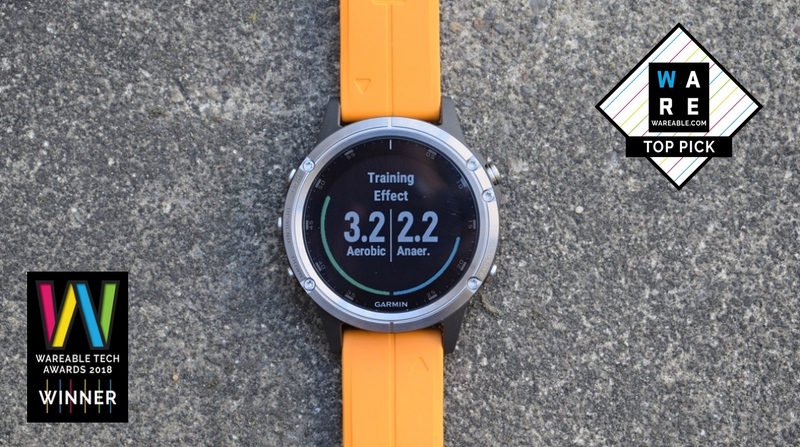 We took the Garmin Fenix 5 Plus out on a few runs and optical heart rate performance was largely good against the Polar H10 chest strap, but certainly not perfect. It's important to remember that optical heart rate has its limitations. It's great for getting an idea of how hard you were working through low to medium intensity sessions – but the technology falls down at high intensity. The Fenix 5 Plus supports ANT+ chest straps, which people doing gym sessions or explosive outdoor workouts should look to instead. But here's how the Garmin fared. Take the below example, where we were doing some interval training. For the first climb, the 5 Plus was struggling to get a good read, resulting in quite a dramatic difference, before it latched on for the rest of the workout. It also took the 5S Plus a little longer to rise and fall, meaning it sometimes didn’t drop as low as the chest strap during those rests. GPS tracking is still pretty good across the range. Garmin’s improved this tech considerably over time, and while there are still some diversions or blips in the results, they’re relatively minor. We should also touch on performance measurements, which anyone in training should find valuable. Slowly but surely, Garmin Pay and music streaming, two relatively recent features, are spreading across all of the Garmin sports watch family. The Fenix Plus trio are the latest to get them. Garmin’s put aside enough space for about 500 songs on the watch. To get them on there, you’ll need to use the Garmin Express desktop program. Sadly, you can’t sync them from your phone, unless you happen to be an iHeartRadio subscriber. Garmin has formed a partnership with the service to let you sync your offline playlists to the watch, via a downloadable Connect IQ app. Deezer support has been promised too, but is yet to surface. Playing music from the watch is pretty straightforward once you know how. A long push of the down button while in an activity will bring up the playback menu where you can skip and pause tracks, or change your playlist to something else. You’ll also be prompted to connect a pair of Bluetooth headphones when you want to play something. I paired both the Apple AirPods and a pair of Libratone headphones with no problem. Garmin Pay is the other new skill the Fenix 5 Plus has learned. In the smartphone app, under the device options, you’ll see an option for Garmin Pay. Tap it and you’ll be prompted to set up your wallet, and Garmin will ask if you’re adding a Visa or Mastercard. Once you’ve added your card details you’ll need to verify it. Annoyingly our bank, HSBC, isn’t yet supported, so we haven’t been able to try this out yet. You can see a list of participating banks here. When it is working, you’ll be asked to enter a PIN, using the buttons on the watch, before making a payment. It’s not as elegant as tapping a fingerprint on a smartphone, but it does the job, so long as the store you’re using it at supports NFC. Then there are your widgets and notifications. Scrolling up and down from the main watch face will run through all of your widgets which, out of the box, include notifications, calendar, weather report, music, compass, performance measurements, stress (which is tracked using heart rate variability) and a graph of your heart rate throughout the day. Finally, let’s talk battery life. Of the new lineup, the 5X Plus is the only one to actually get a battery increase. In fact, the Fenix 5 Plus has less battery than its non-Plus counterpart. Sadly that’s just a fact of having all these new features. Garmin now predicts you’ll get 18 hours in GPS mode, down from 24 hours, and 42 hours in Ultratrac (which increases battery by decreasing quality of data recording), down from 60. We’ve certainly noticed the battery draining a big faster after workouts, and music streaming is only going to aggravate that. It’s still decent, and with intermittent use for workouts between bouts of wearing it as a smartwatch, you’ll get a few days of use. But if you’re planning to have this as your trusty hiking companion, be warned that battery performance has been compromised a bit. Garmin refreshes its Fenix 5 with some welcome new features. Full TOPO maps give this more appeal to explorers of the great outdoors, while new smart features will enhance workouts by letting you leave your phone at home. And of course it's still overflowing with sports modes, offering the most comprehensive tracking for runners, cyclers, hikers and golfers. It's not without faults, but the Fenix 5 Plus is still the sports watch to beat. There are some problems using the optical heart rate sensor on dark skin that Garmin seem unable or unwilling to address. It does not give a consistent 24 hr optical heart rate. Polar has been guilty of this in the past too.